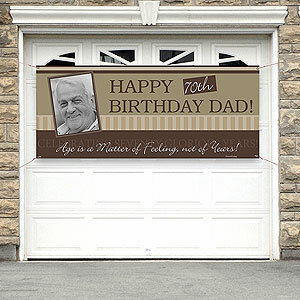 75th Birthday Banners - The Easiest Way to Add Flair to Your Party! Looking for an easy way to add a bit of excitement and style to a 75th birthday party? I think that displaying a cheerful banner (preferably one personalized for the event) gives you the best bang for your bucks! A carefully-selected banner immediately sets the tone for your celebration. And with personalized banners starting at under $20, it’s an affordable extravagance. If you decide to create your own banner, you can make an amazing one for practically nothing other than your time. I love using photo banners for any party! While any type of personalized banner lets the celebrants know that they’re in for a special occasion, a photo banner adds even more oomph to your event. And they’re remarkably easy to create. Once you’ve chosen the picture and it’s on your computer, you just upload the photo to the supplier’s web site using their uploader (you don’t have to download any software onto your computer). Then you just add your text and you’ve got a one-of-a-kind banner that’s sure to draw lots of attention. You can choose a current picture of the birthday celebrant (remember, it’s going to be quite large once it’s on the banner, so choose carefully), or a picture from their younger years. Another option I like is to choose a banner that allows you to display multiple pictures, like this one pictured ﻿at the top. It’s so much fun to see how the birthday man or woman has changed throughout the years, especially for party guests who may not have known the person in their younger days. My favorite site for photo banners is Shindigz. They have a wide selection of photo banners that can be personalized with “75th Birthday”. Each of their banners is available in 7 sizes, from small to ginormous. You can choose from traditional banners with grommets for easy hanging, or they also offer attach ‘n go banners that are printed on low-tack material and are ready to hang directly on the wall – no tape or string required. Their photo editing software is incredibly easy to use, and offers you a preview of the banner before you order it. You can easily move the pictures around and resize them once you’ve placed them on the banner. If you’re looking for pre-made 75th birthday banners, you’re out of luck. There are very few decorations designed and printed just for 75th birthday parties. Your best bet is to look for personalized banners, such as Shindigz. They are easy to design – you just pick your party theme (such as cocktail, luau, night in Paris) if you have one. If you’re not using a particular theme, just pick one that incorporates the colors you want. Then you just add your text. You can add whatever message you would like, including the person’s name and the date of the event if you’d like. Prices start at under $15 for an 18″ x 54″ banner. It’s a fast and fairly inexpensive way to create a striking and memorable decoration for your party. Do you prefer the breezy look of a bunting or pennant banner like the one pictured above? I love the charm of the mis-matched style of the personalized bunting banners at Minted. You can customize these festive banners by adding any message. You can also add photos to the banners. Minted offers 41 delightful patterns of pennant banners, with themes ranging from woodgrain (pictured on the right) to botanicals to nautical themes. 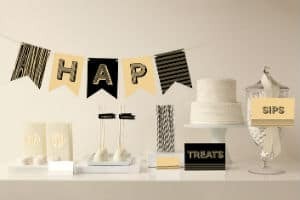 You can also order matching party supplies such as personalized table runners, signs, confetti, and invitations. Prices for banners start at $28 for 16 flags – you’ll save 15% if you order a party package. If you’d like to save a bit of money, or you’re the crafty sort, you can always make your own banner at home. The easiest way is to purchase already-cut banners and stencil or stick pre-made letters onto the banner. This video below shows you how to make your own banner on your computer. Now that you know how to make your own banner, Shanty 2 Chic has some free downloadable fonts that you can use to create your letters. She also includes a few symbols such as hearts, snowflakes, and stars. This tutorial from This Mommy Loves explains how to make an adorable banner using your existing fonts on your computer. Finally, Katy Did and Kid shows how to make a beautiful banner using circular flags. Where do I hang my birthday banner? If you’d like for your guests to notice the banner as they’re arriving at the party, you could hang it over your garage door, over the front porch or door, or at the entryway. If you’d like it to be a focal point at the party itself, you could hang it over any of the tables (food, beverage, present). You could also hang it on a wall or a fence, or string it between trees. How do I hang a banner? Most banners come with grommets at the corners, which will allow you to use ribbon or twine when hanging them up. Bunting banners are strung together with twine or ribbon. You can either tie the twine to nails, pushpins or trees, or use command hooks if you don’t want to put holes in the walls.If you are hosting an indoor event, you can probably tape the banner to the wall. Shindigz offers attach n’ go banners that are preprinted on lightly tacked paper. You just peel the paper off the back and stick the banner on the wall. What size banner should I get? Decide first of all where you’d like to hang the banner. Banners come in a variety of sizes – ranging from 18″ x 54″ all the way to 72″ x 202″. Measure where you’d like to hang the banner and order accordingly.